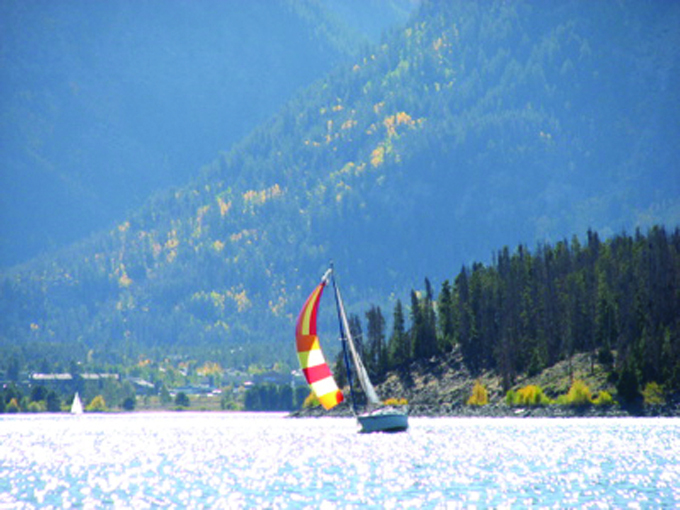 Special to the Daily Learning to sail on Lake Dillon was the start of something wonderful for Lori LeBaron. Years before I even heard of Summit County and Lake Dillon I wrote a list of dreams I would like to accomplish in my life – I guess nowadays more commonly known as a “bucket list.” Among the entries, I mentioned I wanted to go sailing. As the years progressed our family settled here in Dillon and I went to work at Keystone Resort, now Vail Resorts. At that time Keystone had a program for employees to take sailing lessons. I discussed this with my husband and was enrolled in the Beginning Sailing class. After completion of the course, I proudly took my husband Volney and daughter Lacey to Lake Dillon for our new adventure to show them I could sail. The day was beautiful and the lake pristine, however when the first big gust of wind came, I made an accidental jibe, the boom hit Lacey in the head, the boat flipped over and we were hanging on the bottom waiting to be rescued. Oops, I guess I don’t know how to sail afterall! I soon convinced Volney that I needed help and that he should also learn to sail. He completed his course with Dan Dacey and soon we were looking at buying our first sailboat. We spent many wonderful hours on the lake learning together as a team and building our skills. The wind on Lake Dillon is very unpredictable and so we often had words as to who should do what and when, using our newfound sailor’s vocabulary! Sailing has led us to learn to dive in the Virgin Islands turquoise waters. We took our next level of sailing to the Florida Keys where we earned our Basic Cruising Certification. On our last trip to The Virgin Islands we sailed for 19 days. It was glorious. What I want to convey most of all especially to women of any age is to pursue your dreams. Don’t let anything stand in the way of learning anything you want to learn. It has been nearly 10 years now since I first upset the boat on Lake Dillon. While Lacey was convinced I didn’t know what I was doing, I responded that it is like skiing: When you fall down you get up and just keep trying to do better. Last weekend I took a friend sailing who had never been on the lake .The weather was phenomenal with little to no wind. Because she had no experience, I decided to motor about the islands and let her get a feel of the boat. After a while, she took the tiller and I put up the jib and taught her how to tack. We let the motor run as the wind was light and had a great time just playing on the water. Ladies and gentlemen, get out there, you might just find the love of your life, you just never know where a dream will take you.